LAS VEGAS. 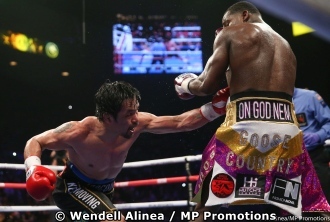 Strength and conditioning coach Justin Fortune said WBA welterweight champion Sen. Manny Pacquiao’s body punches took the starch out of challenger Adrien Broner in their 12-round battle at the MGM Grand Garden Arena last Saturday night. There was some confusion in Broner’s corner early in the fight when his lead trainer Kevin Cunningham told him to jab and he shot back, saying “I thought I was supposed to counter.” That’s what Pacquiao does to opponents. He leaves them confused and exasperated, wondering what to do next in the face of his relentless attack. For a fighter who’s 40, Pacquiao was incredible, considering Broner is only 29. Manny Pacquiao connects with a left to the body of Adrien Broner during their WBA welterweight championship on Saturday, Jan. 19 at the MGM Grand Garden Arena in Las Vegas. Photo by Wendell Alinea / MP Promotions. The three judges had Pacquiao comfortably ahead. Tim Cheatham, Dave Moretti and Glenn Feldman concurred in scoring the second, third, seventh, ninth and 12th rounds for Pacquiao. In contrast, the three judges agreed in giving only the 10th round to Broner. The younger fighter barely survived the final stanza, dancing away the last few seconds to stay on his feet. Pacquiao was the fresher man down the stretch. It was Fortune who said that even if Broner was 100 percent in form, he still wouldn’t beat Pacquiao. At the weigh-in last Friday, Broner scaled 146 1/2 pounds and Pacquiao, 146. For the fight, Pacquiao weighed 149 while Broner refused to get on the scales for another check. A second weigh-in on the morning of the fight is mandatory in the case of IBF championship bouts but optional with the WBA. Pacquiao said he wants Floyd Mayweather next but that depends on whether Money is willing to un-retire. 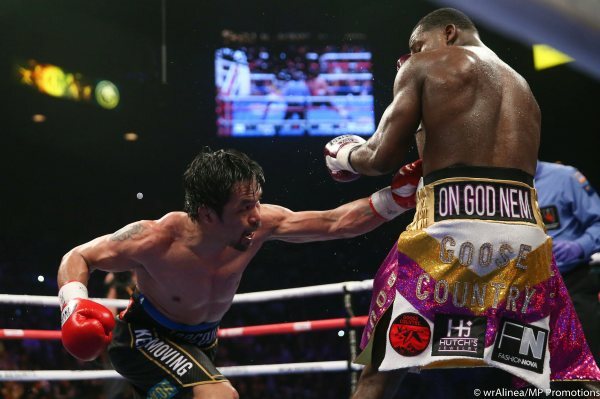 Fortune said if Pacquiao had knocked out Broner, Mayweather would probably turn down a rematch. But since Pacquiao won on points, Mayweather might just agree.